Copper Box Arena welcomed over 1,700 young people for the National Junior Indoor Rowing Championships (NJIRC) at the venue for the first time this month. The event allowed young competitors to showcase their strength, talent and determination on the same iconic stage as Team GB’s Olympic and Paralympic superstars. 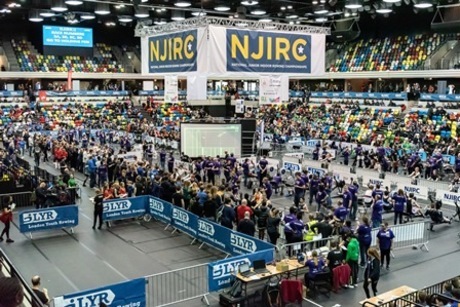 Run by groundbreaking youth sports charity London Youth Rowing (LYR), NJIRC is the biggest junior indoor rowing competition of its kind in the world. LYR aims to enable young people to be and stay active, and to open the sport of rowing to everyone regardless of background, ethnicity, gender, sexuality or ability. NJIRC showcases the incredible talent, drive and energy of many young people who do not normally get the chance to race at a national level, and offers a taste of the buzz and adrenaline of high-level competition. VIP guests included three-times Olympic Champions Andrew Triggs-Hodge and Pete Reed. Alongside the race programme, NJIRC hosted a Festival of Sport and Careers featuring exhibits and activities from Saracens Rugby, British Rowing, West Ham United FC, The Royal Navy, London Fire Brigade, British Cycling, Wheelchair Basketball and more. The Festival of Sport and Careers offered participants a well-rounded event, opening their eyes to wider opportunities and experiences.